Will you need to take insulin injections? But the one thing you're hoping you won't ever have to do is inject yourself with insulin for the rest of your life. See your doctor for a blood sugar test to see whether you need medication or if you can manage your blood sugar with lifestyle changes. Up until now, nearly every blood sugar solution under the sun - old, new, natural or otherwise - targets your pancreas and/or the insulin receptors in your body. But new research shows that targeting only the pancreas to conquer blood sugar is like trying to extinguish a forest fire with a glass of water. 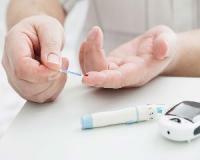 Whether you'll need insulin comes down to just one factor. If you can't lower your haemoglobin A1C with diet, exercise and other diabetes medications, you will need insulin to help you do the job. The American Diabetes Association (ADA) recommends an A1C of 7% or below. The American Association of Clinical Endocrinologist recommends an even lower A1C of 6.5% or below. So, these are the numbers you want to make sure you stay below if you want to avoid taking insulin injections. 2. Throw out the refined carbs. Anything that comes in packaging or from a mill, don't touch. 3. Substitute sugar for xylitol. But use it sparingly - it's not healthy in larger dosages, like those you would need for baking. 4. Exercise every day. Make this part of your new routine every day. It's a must for your blood sugar and so many other aspects of your health! 5. Eat smart. Nuts and seeds like chia and flax fill you up faster and they're packed with good nutrition. Oats, vegetables and bran are also great for you. 6. Find ways to reduce stress. I know you can't just toss stress away but find ways to manage it so that it doesn't manage you. Exercise is fantastic for this. 7. Sleep well. Make sure you're getting enough quality sleep. This means uninterrupted sleep so treat sleep apnea, snoring and prostate issues that may keep you from your quality sleep. 8. Take the right supplements. If your body is not getting the nutrients it needs, you will have a very tough time controlling your blood sugar. Include magnesium, chromium, Alpha-Lipoic Aic, a quality vitamin B complex, especially B1, and a quality blood sugar formula you can trust.